The Margaret Lawrie Collection of Torres Strait Islands Material is the culmination of the life's work of Margaret Lawrie, a contemporary of noted Aboriginal poet Kath Walker (Oodgeroo Noonuccal), who travelled widely with her throughout the 1950s and 1960s. During this time they were both important influences on the development of services to Aboriginal and Torres Strait Island peoples, documenting their history, languages and cultures. 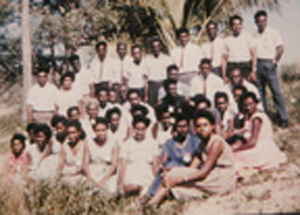 Margaret Lawrie later became interested in the history and cultures of the Torres Strait Islander peoples and spent significant periods in various Torres Strait Islands communities. She gathered first hand information and material about the myths, legends, languages, history, art and culture of the region. Also in the collection are the manuscripts of her two published works, Myths and legends of the Torres Strait and Tales from Torres Strait. The former work was published in both Australia and the United States. Although out of print, it is still widely considered an iconic work. The collection is the most significant relating to the Torres Strait since the one brought back to the UK by the Cambridge University - sponsored Haddon Expedition of the 1890s. The story of ‘Biu’ is found in the Badu Is stories in the book ‘Myths & Legends’ of Torres Strait page 62. Biu [seedpod] is the culprit who falls off the branch on top of the back of the crab [gitalai] and cracks its back. This then sets off a chain of events. This story is well told in the Western and Central Islands. Far left: mother and daughter wearing grass skirts. 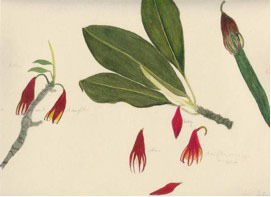 Middle image represents mother and daughter [wearing skirts], the small bud being the baby. The 3rd image is the fruit pod represented by a dried brown flower as being the Dogai [wicked witch or devil -is usually a female]. The flowers and pods are used as toys in storytelling by children on the beach. The flower and pod usually represent characters [see above].Each child takes turns in using one’s imagination in storytelling to other children [audience] or can amuse herself/himself in solitude. It is entertaining and a fun activity. The mangrove tree is found growing in the sea along the shoreline of the islands of the Torres Strait.